The Equality and Human Rights Commission (EHRC) last week published an in-depth new report looking at the problems asylum seekers and refused asylum seekers experience when they try to access health services in the UK. The 77-page report can be read here. Research for the report was carried out by Imperial College London, and the report is a collaborative effort by the EHRC, Imperial College London and Doctors of the World UK. 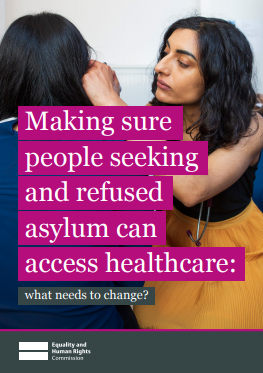 The report finds that people seeking or refused asylum experience clear barriers to accessing healthcare both at systemic policy level and in implementation and practice. The report states: "An important theme that emerged from the research was the perception from people seeking or refused asylum that recognising 'asylum seekers are people too' is sometimes missing from healthcare provision and from the asylum process as a whole, such as the impact of dispersal policy and fears about the asylum process as a whole. "Important barriers linked to policy are the NHS charging regulations and data sharing with the Home Office as well as aspects of asylum policy such as dispersal, and the impact of sometimes multiple accommodation moves. There were descriptions of a direct impact of the charging policy and data sharing agreement (now under review) between the Home Office and NHS Digital on people refused asylum living in England. People also talked about the stress of getting unexpected bills for healthcare and being put off seeking care for fear of deportation and detention, or of accruing bills they could not pay." EHRC says its report shows the need for greater separation of the immigration and healthcare systems. Amongst the report's other findings, researchers found some health professionals lacked knowledge on the entitlements and eligibility of asylum seekers to healthcare. A variety of sources in the research described difficulties registering with a GP because staff believed they were ineligible or didn't provide requested documentation. The EHRC says in almost all cases, this is incorrect refusal and everyone should be able to register for primary care with no documentation. Some asylum seekers said they were worried that their health conditions would be taken into consideration in the asylum process, while others who had traumatic pre-migratory experiences said they found it difficult to build trust in health professionals. The report also finds a number of positive practices, such as medical staff showing empathy and compassion, individuals being referred to counselling services and charities acting as a lifeline for those trying to navigate the asylum and healthcare systems. Accompanying the main EHRC report is an 11-page document setting out the recommendations for what changes are needed to make sure that people seeking and refused asylum have full enjoyment of their right to health. You can read it here. Ensure a clear separation between immigration proceedings and the provision of healthcare services. Review current Home Office accommodation and dispersal policy and practice to ensure that healthcare needs, especially of disabled people and pregnant women, are met in the provision of asylum accommodation. Ensure that people seeking asylum have the necessary financial resources to fully access healthcare services. Provide clearly communicated and accessible information to people seeking and refused asylum in a way that improves understanding of their rights to access health services, including specialist services such as gender specific or mental health services. Ensure that healthcare services are able to provide professional interpreters to help people seeking and refused asylum to navigate unfamiliar healthcare systems, facilitate clear communication between patient and doctor, and ensure informed consent for any treatment. Increase the knowledge among both clinical and non-clinical healthcare staff of the healthcare rights and entitlements for people seeking and refused asylum, and ensure that this understanding is applied in practice. Put mechanisms in place to monitor and address any barriers to accessing healthcare services experienced by people who are or have been in the asylum process, such as instances of incorrect refusal of GP registration. Rebecca Hilsenrath, Chief Executive of the EHRC, said: "Everyone should have access to good quality healthcare, regardless of who they are and where they come from. People seeking and refused asylum are likely to have particular health needs because of past distressing experiences and the traumatic effects of fleeing to a different country. It's therefore crucial that they are able to fully and easily access healthcare and that their rights are protected by keeping healthcare separate from immigration enforcement. This is just about common humanity. "We encourage the UK Government and healthcare providers to review this new research and take action on our recommendations to ensure health services are culturally appropriate, accessible to everyone and that staff are trained to recognise and respond to the specific needs of marginalised patients."